TOKYO, July 13, 2016 - (JCN Newswire) - NEC Corporation (NEC; TSE: 6701) today announced the development of the new ARmKeypad Air, where "smart glasses" are used to turn the arm of a wearer into a virtual keyboard, allowing for contact-free operation. Yukio Maruyama, Assistant General Manager, System Integration & Services Market Development Division, NEC Corporation said, "Moving forward, NEC will use the ARmKeypad and ARmKeypad Air to help improve workplace efficiency in sectors where hands-free operation is required, such as manufacturing, medicine, security, and distribution." 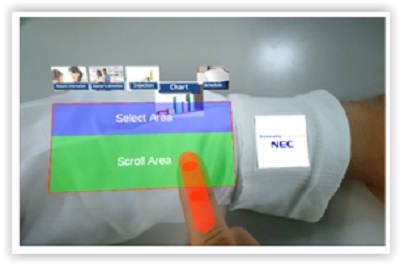 NEC Corporation today announced the development of the new ARmKeypad Air, where "smart glasses" are used to turn the arm of a wearer into a virtual keyboard, allowing for contact-free operation.